Sugar and Ice will process all orders placed before 3.00pm (Monday - Saturday) on the same day, this excludes bank holidays. All customers will be notified directly once their delivery has been shipped, please do check your spam folder for this notification. Delivery is charged on a number of factors, including weight and size of parcels, the charge will be calculated at checkout, as a guide please see the table below. Available for collection after 11am next working day, you will be notified by email when your order is ready to collect, please check your spam folder for this email. Available on all items excluding aerosols, charged at £3.50 for parcels up to 2kg in weight. Order before 3.00pm Monday - Saturday and your parcel will be shipped the next working day. Royal Mail first class aims to deliver the next working day. Couriers include DPD, Parcel Force, Hermes, UKMail. Poor weather conditions and bank holidays may result in extended delivery times, if you live in a remote area of the UK you may also see some delivery delays. Our couriers tend to keep you updated via text or email. Whilst Royal Mail endeavour to deliver in 3 working days, please allow one week for delivery, if your item has not yet arrived it may mean that you have missed your delivery, please contact us if this is not the case and your parcel has not yet arrived. Sugar & Ice aims to provide an easy and efficient postage service to all its customers, in order to continue to promote this we request that you, our customers, keep your details up to date. If you miss a delivery you will have to rearrange this directly with the Royal Mail or the chosen Courier, details of how to arrange a redelivery or collect from local post office will be available to you on your missed delivery slip, alternatively these will be available on the couriers website. In the event a delivery provider has to return a parcel to our store (e.g. you miss a delivery and do not rearrange or collect in store) you will be charged a £4 - £10 handling charge for this return. In some instances (not often) when posting items, Sugar & Ice may ship your order in more than one parcel. If this is the case please do confirm that you are signing for the correct number of parcels - we cannot argue that only one box was delivered if you have signed for two. We offer a free click and collect service for customers living locally who prefer to collect rather than wait for delivery. This service will have your items ready to collect from 11am the next working day after your order is processed, we do endeavour to have items ready as soon as we can. This service is available on all orders, orders under £5.00 do incur a small handling fee. All you have to do is add your items to your basket as normal and select click & collect within the delivery options. Please note that click & collect is only available at our Coalville store currently (24-28 Hotel St, Coalville, LE673EP). Certain items may only be available via click and collect only due to their fragile nature. Orders placed using our click & collect service will be available to collect Monday - Friday 9.30am - 4.30pm and Saturdays 9am - 4pm (excluding bank holidays). Click and collect orders will be held for a maximum of 14 days (as mentioned above), after this time you will be issued a full refund for the goods minus a 50p processing charge. Much like our service in store, if you would like to purchase something that is not currently in stock you can do so. We provide the special order on products such as cake bases, bulk packets of products and more. Once you have placed your order and the item has arrived in store, we will notify you it's ready to collect (or post out), unfortunately we cannot guarantee a special order product's availability however will notify you of any issues as soon as reasonably possible if we struggle to get the item(s) for you. To order a Special Order Product you can complete the check out process in the same way as you would with products currently in stock, we will send you an email as soon as the product arrives in store and is ready to be collected (or shipped out to you). The timeframe provided within the product description is an approximation only and whilst we aim to ship within the timeframe there may be instances where that is not possible. 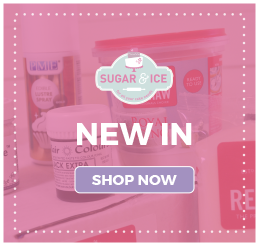 If an item has arrived in store too late (and we have not yet shipped it) please contact us on info@sugarandicecake.co.uk and we will be happy to credit you for that item. If the item has already been shipped please follow our standard returns procedure. If you need to edit or cancel an order (both delivery or click and collect orders) you must do so within 30 minutes of ordering, this can be done by telephoning the store on 01530817210 or emailing info@sugarandicecake.co.uk. Cancelling or editing orders may not always be possible, please refer to the information below to confirm if your order can be edited or cancelled. Please note that orders of made-to-order goods / personalised items where work has commenced cannot be cancelled or edited. Orders which have already been shipped (you will receive notification when this has happened) may not be eligible for cancellation, for example perishable goods and personalised items once shipped cannot be returned, so please double check all orders before submitting payment and if there is an issue please contact us immediately (01530817210 or info@sugarandicecake.co.uk). We at Sugar & Ice have tried to make our returns service as simple and fuss free as possible, further details of which can be found below, in our FAQ section and via email. Please note: our in store returns policy may differ to that of online orders. Having operated cake decorating shops since 2002, it’s been our mission to provide top quality products to all. If a product arrives and is damaged, faulty or is incorrect please contact our team as soon as possible to inform us of this. You must notify us within 14 days of delivery. Sugar & Ice are happy to replace or refund any damaged, faulty or incorrectly supplied item right away, in order to do so we may require a photo of the damage or fault so that we can claim with our courier or supplier. In some cases the item may also need to be returned to us so that we can identify the problem and return faulty product to our supplier(s). If this is the case, Sugar & Ice will reimburse reasonable returns postage costs up to the value of correctly calculated 1st class post if arranged with our team in advance (e.g. you are instructed to return the item by our team and notified that we will provide a refund for your returns postage) . Items returned without first arranging with our team are done so at customer’s own risk and cost, in every instance you should always request proof of postage. If a replacement is required urgently, we may send a replacement item free of charge on the understanding that you are returning the damaged/incorrect item. If we do not receive the return of the original item within 14 days you will automatically be charged the amount of the item being returned. If you would prefer a refund over a replacement we will refund the full amount you paid for the incorrect / damaged item including any standard delivery costs, any additional charges paid at the time of order are not included in this refund amount. If an item was not what you expected or you simply changed your mind, Sugar & Ice are happy to credit your account on return of the item, providing it is unused/new and is still encased in its original packaging, allowing for the Company to stay well within Food Hygiene and Safety guidelines. Customers must contact us within 14 days of receipt and return the item within 14 days of notification. In this circumstance any returns postage costs are payable fully by the customer. Perishable goods (e.g. cake bases and edible products) and personalised items are excluded from regulations and cannot be returned unless faulty. It is not usual to accept returns on any edible goods unless faulty, as it is not good food hygiene practice to offer edible for resale once they have been sold and returned. Sugar & Ice understand that customers ordering goods at a distance (e.g. online) have the right to examine goods on delivery and can decide to then return them. This does not include trying or using an item, removing or damaging its retail packaging. Customers who return items (whether it is a single item order or multiple) Sugar & Ice will refund the cost of the item minus any shipping costs. This is only applicable to customers who contact us within 14 days of receiving your goods and return the items within 14 days of notification of exercising your right to return, please remember that you waive your right to return when purchasing perishable and personalised items (unless they are faulty). All UK customers are covered by regulations such as The Consumer Contract Regulations (Distance Selling Regulations), The Sale of Goods Act, The Consumer Rights Act. However some business-to-business transactions of distance selling are not covered in the same way retail customers are. If a product is incorrect, faulty or damaged then trade customers (business-to-business transactions) are eligible for a replacement or refund of the product, however if a trade customer changes their mind about a product they cannot return the item for a refund or exchange. Required information: As per the UK government guidelines for distance / online selling JSJ Projects Ltd. (T/A Sugar & Ice) must provide all of the following information. Our business details, a description of goods and services, including prices and payment methods, delivery arrangements, your right to cancel, how you can place an order, how to rectify errors, our VAT number, total price including delivery charges and we must provide an email confirming your order (please check your junk/spam folder for this information). If you believe we could improve any of our information please do contact us and we will be happy to correct this. Simply browse and select your chosen items and click add to basket (with the quantity required), then select check out, you will be prompted to complete your chosen delivery service, read the terms and conditions and input your details. You will then be requested to make payment for the goods within your basket and finalise your order. You will then receive an order confirmation from us and a notification when your order has been processed (please check your spam folder for this information). Yes, you can cancel orders within 30 minutes of purchase if you do so (and we confirm we have received this notification to cancel) Sugar & Ice will refund you the full cost paid including shipping costs. In the instance that the item has already been shipped (you will receive notification of this) you will have to request to return the product instead, please see our Delivery & Returns section for information on this. To cancel you must contact the store on 01530817210 or email info@sugarandicecake.co.uk. You have the right to cancel an order at any point up to the 14th day after delivery, if this is the case you will receive a refund for your goods minus any shipping costs paid. Refusing delivery is not the same thing as exercising your right to cancel an order or right to return so we strongly advise against refusing deliveries. You must initially email us to inform us of your intention to cancel under regulations, within 14 days of receipt and you will receive an acknowledgement as soon as we have received your message. If you do not receive an acknowledgement within 24 hours it means that we have not received your email - please call us to confirm if this is the case. Please note that under regulations, simply sending a message is not sufficient, you must actually make contact (e.g. receive a reply). You must then return the order to us within 14 days from making the point of contact. If you do not make contact with Sugar & Ice before returning an order (or you refuse a delivery), then the regulations state that this is not understood to be exercising your right to cancel and the order remains your responsibility and that any subsequent delivery and returns costs cannot be refunded. Should the order subsequently be damaged or lost then the responsibility is yours, not ours, so we cannot refund unless it is received by us in an acceptable condition. In any case, if you choose to return an item it is your responsibility to securely package and pay for the returns postage of the product(s), we recommend you post this either signed for, via courier or at a minimum receive proof of postage. Some products are exempt from return due to distance selling, these products are any perishable goods (e.g. cake bases & edible products) and peronalised items (unless faulty). Items which have been used or removed from their retail packaging cannot be refunded due to food hygiene and safety, which is and always will be a top priority at Sugar & Ice. Please note our in store returns policy may vary from that of online sales. Will I receive a full credit / refund? Yes, providing you have followed the steps outlined surrounding our returns process. We will receive your return, check over the item(s) to confirm the condition and that the items have not been used, if the returns are acceptable then we will credit your account or provide a full refund in the way that you have originally paid minus any shipping or handling charges. We aim to process all refunds within two working days and depending on bank processing times your refund may take up to 14 working days to show your account. Please note, as mentioned above you will not receive a full credit / refund on personalised goods. Please note that if you choose to return an item, you will not be refunded your returns postage, you are able to return items free of charge in store (excluding non-returnable goods). For all returns, made in store or via post you will not be refunded for the original postage paid. For damaged, faulty or incorrect items that are returned to us, we will refund reasonable returns postage costs (please see outlined in delivery and returns area). As a business customer (e.g. purchasing to use to create your own cakes and decorations for your customers) you are still entitled to returns and refunds if products received are damaged, faulty or incorrect. When completing a business-to-business transaction you are not entitled to the same refund policy as retail customers, which means that you are not entitled to a refund or exchange if you change your mind about an item. Refund for business customers will be processed via a credit to your account as opposed to refunding via credit card unless there is specific request to do so. Sugar & Ice expect trade customers to be those who use products for their own use, for example creating their own cakes rather than reselling products to the public. If you choose to resell products then this is at your own risk, this means that if any items are damaged in transit and leak or spill onto another product the Company will replace or refund the damaged item and not the additional item which had product split onto it, as long as after a clean the product will be acceptable for us (e.g. airbrush colour leaks onto a smoother, the colour will be refunded).